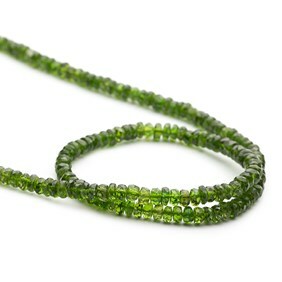 Stand out from the rest with diopside gemstones. 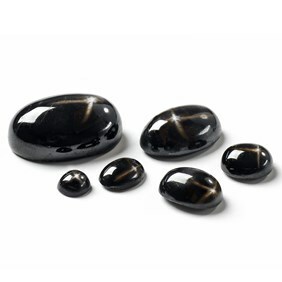 Explore our black star diopside cabochons available in a range of sizes and rare chrome diopside faceted rondelle beads - also known as the 'million dollar emerald'. Diopside gemstone can be found in two forms; the black star diopside and chrome diopside. Chrome diopside, also known as 'million dollar emerald' is one of the rarer varieties of diopside which comes in beautiful rich, forest green colour. Chrome diopside is often compared to emerald, but unlike emerald which has inclusions, chrome diopside has an amazing clarity. For a long time it was only sourced in Russia's Eastern Siberia but more recently deposits have been found in Pakistan. It measures 5.5 on the Moh's hardness scale. Shop our range of jewellery settings for cabochons or our range of beading threads and jewellery findings to get making! We also have an extensive range of silversmithing supplies for all your needs. Explore our beginner's jewellery making kits with step by step instructions for inspiration or check out our jewellery making tutorials on silversmithing, wire-wrapping, beading, stone setting, texturing and more. Diopside is said to help with compassion, forgiveness and reconciliation.